The prehistoric settlement submerged under Lake Kuolimojärvi provides us with a clearer picture of the human occupation in South Karelia during the Mesolithic and Early Neolithic Stone Age (about 10,000 – 6,000 years ago) and it opens up a new research path in Finnish archaeology. In the early Stone Age, the water levels in the small lakes located in the southern parts of what are today Lake Kuolimojärvi and Saimaa were several meters below the present levels. After this period, the water levels started rising as a result of uneven land uplift and the tilting of lakes and rivers. The rise in water levels ended with the outburst of River Vuoksi through the Salpausselkä Ridge about 6,000 years ago when water masses carved a new southeastern outflow channel towards Lake Ladoga. Drone photo over Kammarlahti. The raft anchored in the research area. Image: Jesse Jokinen/Museovirasto. The aim of the three-year study carried out by the University of Helsinki has been to find traces of early Stone Age settlements under water and from wetlands at lakes Kuolimojärvi and Saimaa. So far the oldest sites have been settled after the breakthrough of River Vuoksi (6000 years ago and onwards). However, there has definitely been human habitation in this area for thousands of years before that, as is shown by the traces of settlements of more than 10,000 years old discovered at Kuurmanpohja in Joutseno further to the south. Drone photo on the excavation area on the west side of Kammarlahti. Image: Jesse Jokinen/Museovirasto. Eveliina Salo taking samples of the hearth structure. Image: Jesse Jokinen/Museovirasto. 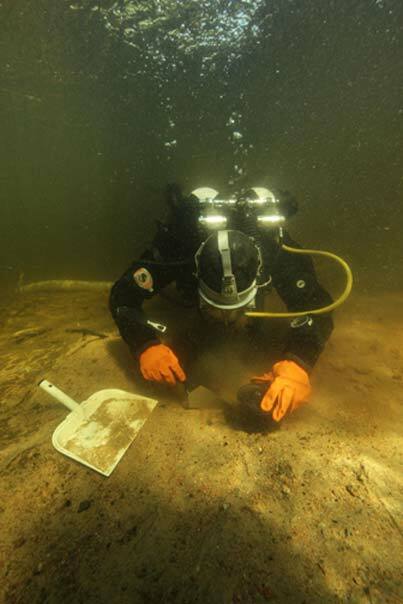 The hearth feature and associated find materials indicate that a submerged Stone Age settlement site has now been located at Lake Kuolimojärvi – the first undisputed observation of this kind in Finland. The nearest similar sites are located in northwestern Russia and southern parts of Scandinavia. It is clear that the hearth feature, which today lies at a depth of about one meter, and the other finds are from the period before the rise of the water level (about 9,000 to 8,000 years ago). The archaeologists managed to take a soil sample of the burned layer around the hearth and are now trying to find datable material from it. Satu Koivisto and Jørgen Dencker examining bottom sediments. Image: Eveliina Salo/Nordic Maritime Group. "With the excavation equipment tested in the underwater research at Kammarlahti, we may also be able to find other submerged sites at similar locations. For this reason, the discovery opens up an entirely new era in the research into the Finnish Stone Age. Many of our large lakes, such as Vanajavesi, Pielinen and Oulujärvi have also gone through similar fluctuations in water levels. 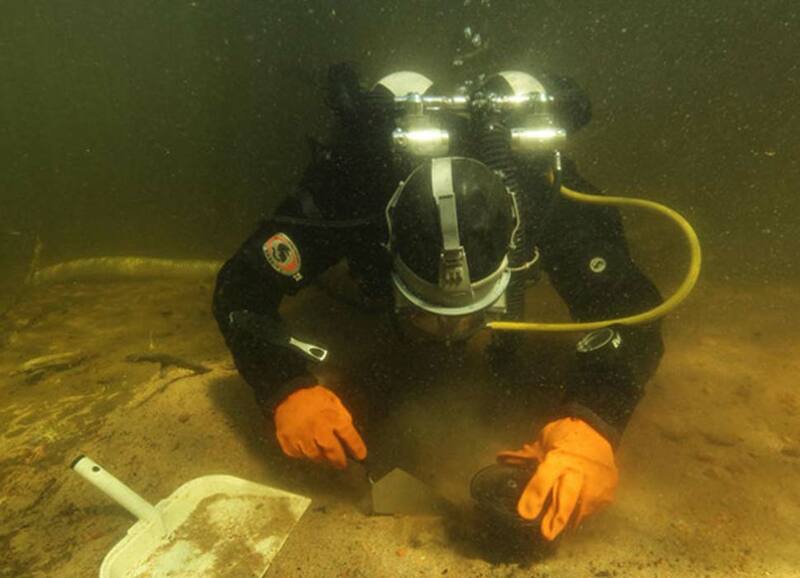 This means that a huge and largely untapped archaeological resource is hidden in Finnish lakes. Moreover, extremely old organic materials may also have been preserved in these environments for thousands of years,” Satu Koivisto says, describing Finland’s underwater archaeological potential. Top image: Eveliina Salo taking samples of the hearth structure. Source: Jesse Jokinen/Museovirasto. The article, originally titled ‘ Archaeologists found traces of submerged Stone Age settlement in Southeast Finland ,’ was first published on Science Daily . Being pedantic here, but the 'Lake' in 'Lake Kuolimojärvi' is a tautology. 'jarvi' means 'lake' in Fiinnish.